I love to read books and talk about them. If I love it or hate it, I want everyone to know about it! When I'm not reading, I knit. I love to talk about that, too. I always have pens and needles about, ready to jot something down or get a few stitches in. And I'm always excited about the next new thing tomorrow brings. 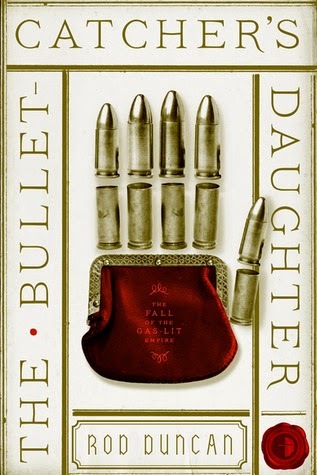 The Bullet-Catcher's Daughter is the foundation novel for an alternate history series with light steampunk elements. Rod Duncan presents a future in which society is stuck in the Victorian Era, technological advances suppressed by the government in an attempt to keep peace in the world. Britain is divided into two territories as part of the treaty that ended the British Revolutionary War. The Anglo-Scottish Republic and the Kingdom of England and South Wales are just two of the territories under the jurisdiction of The International Patent Office, the agency responsible for eradicating morally and socially dangerous science. Elizabeth Barnabus is in exile in the Republic, making a meager living as a private detective. Since women are prohibited from owning property or businesses in the Republic, she uses her carnival skills of illusion to create a male identity for trade purposes. Her 'twin brother' is able to sign contracts, buy property, and move freely in areas where Elizabeth is limited by her gender. In desperate financial trouble, she takes a missing person case for an aristocrat from the Kingdom, knowing she's placing herself in great danger. She's wanted in the Kingdom. Five years ago she ran from a sentence of indentured servitude, and one step across the border would almost certainly place her in the Duke's hands. I liked a lot about this book. Traveling circuses, illusions, deceptions. I like that the steampunk elements aren't over the top, and it isn't romance-heavy, either. By the end of the book I had a good understanding of the world and politics, mostly revealed through Elizabeth's travels and narrow escapes. I wish for a little more depth of characterization in the secondary characters. This is an excellent foundation novel for a series. I'm interested in the people and the politics, and see a lot of room here for story development. 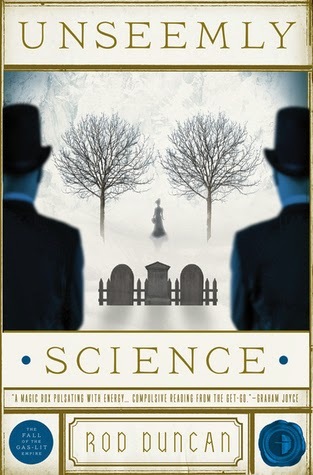 The next installment in The Fall of the Gas-Lit Empire series is Unseemly Science, due out May 2015. Harlan Coben's latest stand alone is a winner! Cynthia has read 5 books toward her goal of 25 books. 5 stars: Big impact. Destined for a re-read. 4 stars: Really enjoyed it. Recommended read. 3 stars: Good book, but not amazing. Liked it enough to read the author again. 2 stars: Sigh. Something's missing here. Could be plot, good grammar, believability. 1 star : Beyond redemption. Kudos to me if I finished it. Cynthia has read 93 books toward her goal of 250 books.